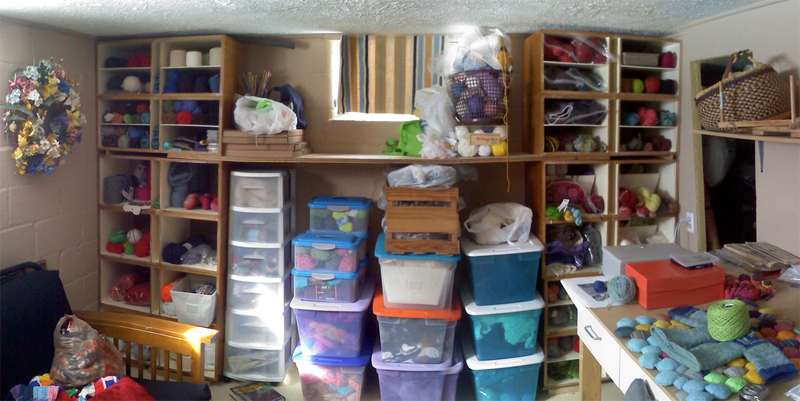 With the impending birth of the little one, my yarn room had to move. 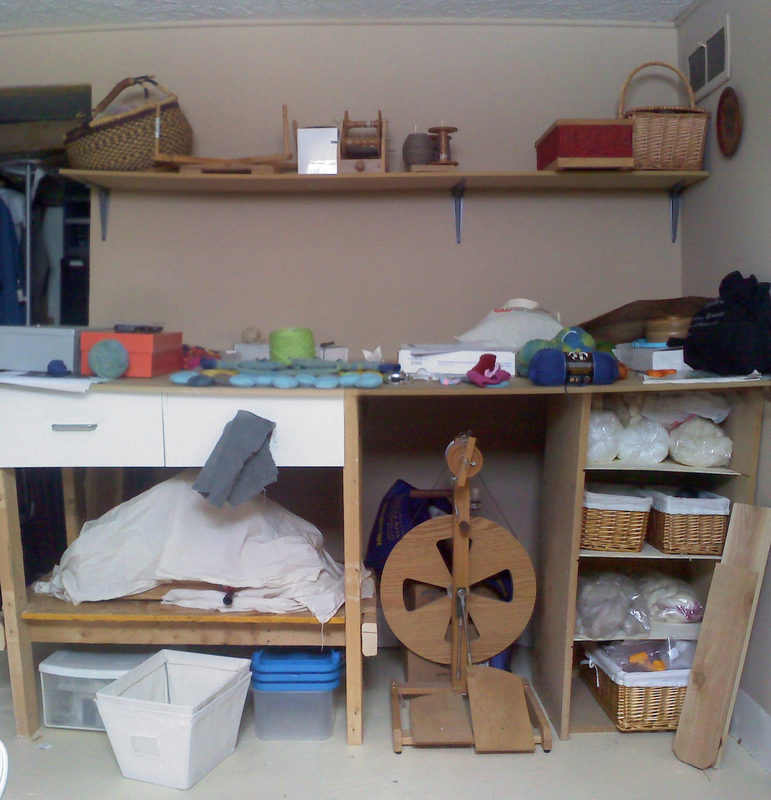 What used to be the yarn room is now (in process of being) set up as the nursery, and what was the home office has now all but disappeared and been replaced by my studio. It’s not perfectly organized, not neat and orderly, but it’s mostly reached the point where I can find things, which took awhile. The north wall of the new studio space, what you see from the doorway. The east wall of the studio, to the right of the entry way. It does get a decent amount of daylight, especially for a basement. It was a bit difficult to get photos, actually, because the windows were completely blowing out! On the west wall is a couch, which serves double duty as a guest bed. Oh, I almost forgot: A bookshelf in the next room, right next to my usual knitting spot, has my reference books and patterns. It’s not perfect, but it’s functional, which is better than perfect. I’m so thankful for all the hours Paul put in getting it all moved, the floor painted, and helping me get it semi-organized. And it’s *done enough* that we’ve been able to focus on other things the past few weeks, which has been a necessity. This entry was posted in WordLily and tagged fiber arts, storage, studio, yarn, yarn room. Bookmark the permalink. Wow that is….a lot of supplies! I know, it’s kind of crazy, huh? I’m sure it feels good to get that done! Thanks! We scored the cubes at a thrift store, they’re solid oak covers for portable heaters made locally (Sunheat). My husband attached groups of four, to make them more sturdy, and then routed slots to accommodate the thinner shelves/dividers where used. And he painted them. This is the third studio (and third configuration) I’ve had them in, they’re really handy! He’s got some in his studio, too. And another friend bought the rest for use as cabinets. Agreed, tote towers aren’t the sturdiest, nor the most attractive, but sometimes … you do what you’ve got to do. It looks lovely Hannah! And I really miss basements. I loved your suggestion of moving up north during my 33rd year. 😀 It’s not going to happen, sadly, but it would be fantastic if it did! Yeah, I kind of figured you wouldn’t be hanging around waiting for such a suggestion if you could make that one happen. :p Ah well. We really missed basements when we lived in Arkansas, too. We’re pretty picky; even up here where they’re common, they’re too often wet (= moldy). But in the right neighborhoods you can find a pretty reliably dry one.